This entry in the MSX hall-of-fame is slightly unusual in that GoldStar is not a Japanese company (as nearly all MSX builders were) but Korean. With a style that looks as if it might have been designed in Pyongyang rather than Seoul and "state of the art" features like 64K of user RAM, the Goldtsar MSX was otherwise a standard MSX machine (which was not too surprising really as the requirements of being an MSX machine left relatively little for individual companies to differentiate themselves with, apart from a bit of extra memory or some additional ports). It was, however, very cheap, coming in at around £240, or about £770 in 2019 terms, which compared well to something like Yamaha's CX5M, which retailed for £534 (£1,630), although that particular machine did include a rather natty synthesizer keyboard. 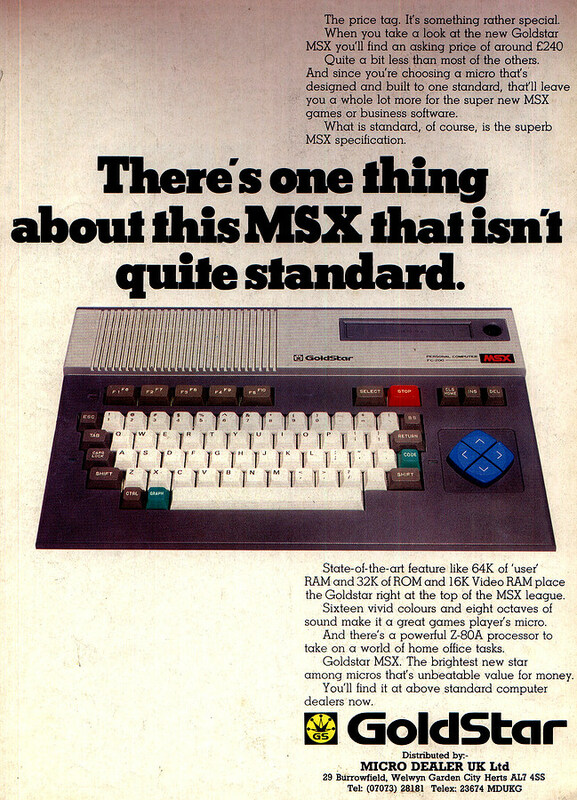 The Goldstar was one of the first MSX models available in the UK - when it was spotted at the seventh Personal Computer World Show in September 1984, an MSX machine was still considered something of a "rare bird". When it was to finally ship was still a mystery at the time, although sole distributor Microdealer UK hoped it would be "by Christmas".